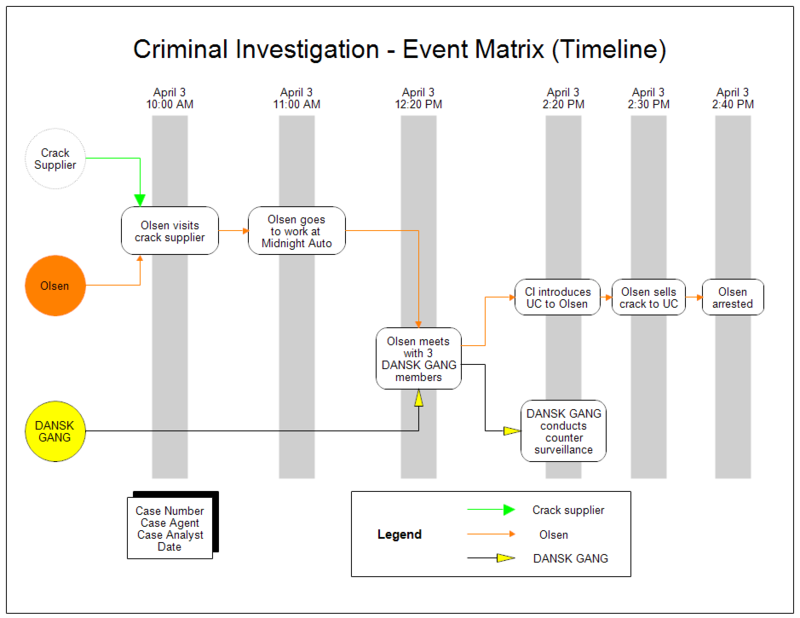 Description In this criminal investigation timeline, the people involved are shown on the left in circles. The events are in rectangles set on gray bars. At the top of each gray bar is the date and time the event took place. By following the lines from the circles to the events, you can see which people took part in which event. The timeline helps to explain a criminal operation. The timeline shown above was generated in RFFlow from data. The data was in an Excel spreadsheet and saved as a .csv file. The .csv file was then opened in RFFlow to generate the chart. The above timeline is a criminal analysis timeline. RFFlow can also draw other kinds of timelines with the same data. Once RFFlow is installed, you can open the above chart in RFFlow by clicking on timeline_event_matrix.flo. From there you can zoom in, edit, and print this sample chart. It is often easier to modify an existing chart than to draw it from scratch. To draw this chart without downloading or generating it from the data, run RFFlow and click on the More Shapes button. Scroll to the Criminal Analysis folder and click the plus sign to open it. Then click the Event Flow and Timeline stencil and click the Add Stencil button.